In the 1930s, Rancho Los Cerritos was remodeled to become a single family home, and today’s gardens reflect those changes. The historic house sits on 4.74 acres of manicured gardens, designed by noted landscape architect Ralph D. Cornell. Today, the gardens remain sensitive to Cornell’s landscape design, circa 1930s, and many of the existing garden features have been maintained. Many trees on site predate the 1930s. At nearly 175 years old, the Rancho’s historic Italian Cypress tree stands majestically in the backyard. John Temple, the settler who built Rancho Los Cerritos’ house in 1844, planted the tree for its great height and fast growth. Rancho Los Cerritos once stretched from present-day Paramount to the Pacific Ocean, encompassing more than 27,000 acres, and the Italian Cypress served as a landmark for visitors to find their way to the ranch house. Today, it is considered a notable tree of Southern California. 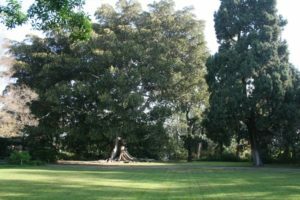 With its beautiful root system and dramatic canopy, the Moreton Bay Fig was planted in the late 19th century, and is in fact two trees that have grown into one. It’s an ideal spot for photo opportunities and makes a spectacular backdrop for wedding receptions. RLC’s inner courtyard was once a work yard for shoeing horses and fixing wagons. Today, the formal inner courtyard features a pond and fountain, true to Cornell’s vision. In the early 2000s, the California Native Garden, outside the Visitor Center, was installed. 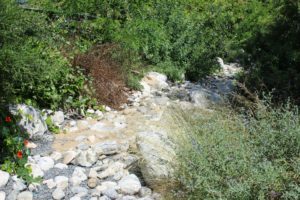 It features a seasonal creek, riparian trees, and a serene walking path. Southern California Native American groups, including the Tongva and the Chumash, have relied upon plants found in the California Native Garden to provide food, shelter, medicine, and clothing. 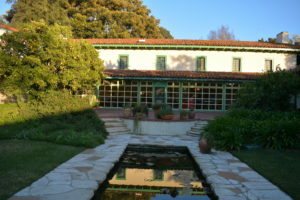 Rancho Los Cerritos offers garden tours every weekend or on weekdays by arrangement. Visitors are free to explore the gardens on their own during open hours, Wednesdays-Sundays, 1-5pm.